One of the biggest ism’s on the Street that has been pounded to death by any and all financial sites is the fact that the stock market is the greatest discounting mechanism in finance and is always looking out 6 to 12 months. This may seem rational to all you EMH’ers out there and there is of course evidence that can be pointed out supporting the markets’ abilities to discount for future events. Feel free to scour the web for all data pertaining to this notion. I’m not going to get into the facts and fiction of the mechanism. I just want to provide a little reminder that the forward looking ability of the markets gets a bit fuzzy at the extremes. Whether it’s is an epic crash, a normal correction, or a bottom-ticking nadir; at the extremes the markets don’t exactly send the clearest message. Have a look at the S&P 500 since 2009. You can see that the Flash Crash came out of left field for a lot of speculators in 2010. That strong uptrend wasn’t giving anybody any kind of forward guidance regarding what was about to happen in May 2010. How about the end of QE 2 in 2011? The last “real” correction this market has seen. It too had a nice positive uptrend going before pulling the rug out in the summer. Sure the normal seasonal platitudes could have been rested on, but nobody saw the blowout in August coming. And finally, look at the choppy action in 2012. It was difficult to get a bead on how to allocate, because everyone was busy worrying if the Fed would keep the punch bowl spiked and the dj dropping the base. Did that choppy action of 2012 tell you that 2013 was going to be a mega-homerun year for people who simply invested long? Hardly. Even though the Fed announced to the world that it would provide unparalleled levels of liquidity to market players, many a professional was caught off guard at the strength of the move. 4. The approach of no quantitative easing – seriously think about that for a second – NO QE if the Fed follows through on their word; a full taper is most definitely not being discounted. We’ll just leave it at that. 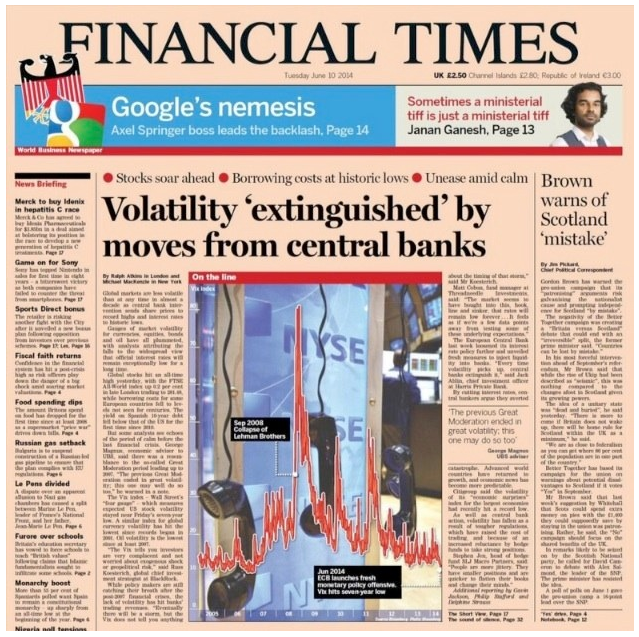 For good measure though I’ll present you with a snapshot of the Financial Times cover from Tuesday June 10th, 2014. This has been bandied about all over the web as the “Contrarian Indicator of the Year”, with the FT extolling the virtues of Central Bankers’ abilities to remove volatility from the investment picture. I’m not here to debate the efficacy of the Magazine/Newspaper Cover Indicator. If, however, this cover proves to indicate a bottom in volatility in 2014, did the markets discount that?